Medicine is one profession in which qualified personnel will remain central despite all the advances in technology that are taking place. It is generally believed that shortages in this sphere have limited our ability as nation to make healthcare widely available. One way to solve this problem is to seek to expand the supply of traditionally qualified allopathic doctors but that is likely to take time. Additionally, it is not at all clear if, even with expanded supply, these doctors would be willing to serve in primary care and rural settings where the need is the greatest. Attempts to compel them to do this, even for short periods of time, have presented their own challenges and have not been very successful. The other alternative would be to examine if the law permits similarly trained but non-MBBS physicians and nurses to practice allopathic medicine. The judgement of the Supreme Court in Mukhtiar Chand v The State of Punjab (AIR 1999 SC 468) is a watershed in terms of permitting a wider cross-section of medical practitioners to be able to practice allopathic medicine, subject to appropriate regulation. The Mukhtiar judgement embraces themes that are central to India’s constitutional values such as, (a) the right to life under Article 21 and balancing it with the right to practice any trade or occupation under Article 19; (b) federalism and the right of States to legislate on matters in the concurrent list; and (c) the interplay of state legislation with central legislation. The judgement upholds the right of medical practitioners qualified under “integrated degrees” and registered with medical registers maintained by States in India to practice and prescribe allopathic medicine. The power to legislate on “legal, medical and other professions” stems from Item 25 of the Concurrent list of the Constitution of India. Accordingly, both the Centre and the States have the right to enact laws relating to the practice and regulation of the medical profession. In this regard, the Centre has enacted the Indian Medical Council Act, 1956 (“IMC Act”). The IMC Act defines a “registered medical practitioner” to include, in addition to persons holding qualification specified in the Indian Medical Degrees Act, 1916 and the IMC Act (which do not presently include integrated courses), persons registered or eligible for registration in a medical register of a State meant for the registration of persons practicing modern scientific medicine (excluding the homeopathic system of medicine) and is formally declared by the State Government as a person practicing the modern scientific system of medicine for the purposes of IMC Act. Accordingly, the IMC Act expressly acknowledges and recognizes the ability of States to permit persons other than those holding qualifications specified in the IMC Act and the Indian Medical Degrees Act to practice modern scientific system of medicine. In light of the decision of the Supreme Court in the Mukhtiar Chand Case, there are two pre-requisites for non-MBBS physicians to practice allopathy namely: (a) they should be registered in a medical register of the concerned State in which they practice (excluding the register for the registration of homeopathic practitioners); and (b) the concerned State Government through a general or special order should have declared them as persons practicing modern scientific systems of medicine. Such State registers are not maintained in accordance with the terms of the IMC Act but rather the respective State Acts relating to the registration of medical practitioners, which could provide for enrollment in State register on the basis of degrees other than what may be considered “recognized medical degrees” under the IMC Act. Accordingly, several States have issued orders permitting medical practitioners who may have earned “integrated degrees”. For instance, in the State of Tamil Nadu, the Health and Family Welfare Department published a notification dated September 8, 2010 declaring every registered medical practitioner in the State of Tamil Nadu and holding the qualifications specified in Indian Medical Central Council Act 1970, and the Tamil Nadu Siddha System of Medicine (Development and Registration of Practitioners) Act, 1997, as a person practicing the modern scientific system of medicine and eligible to prescribe allopathic medicines in terms of the Drugs and Cosmetics Act, 1940 and rules thereunder. Accordingly, it seems that that every registered medical practitioner in the State of Tamil Nadu who holds the appropriate qualification (excluding homeopaths) is entitled to practice allopathic medicine. 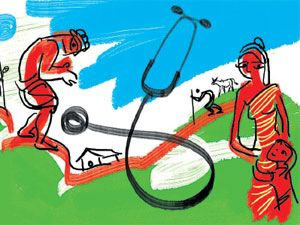 Such orders could legally permit appropriately qualified practitioners, who may not hold conventional medical degrees to practice medicine and offer primary care to millions of Indians living in remote parts of rural India who are otherwise facing a severe shortage of medical professionals and healthcare services. The Supreme Court in the Mukhtiar judgment also emphasized the need to balance the right to practice any trade or occupation in terms of Article 19 of the Constitution with the laws relating to technical or professional qualifications, keeping in view the right to life and proper medical health care. The Supreme Court stated in no uncertain terms that there can be no compromise on the professional standards of medical practitioners. Accordingly, although States are empowered to permit medical practitioners to be enrolled in state registers to practice modern medicine, such orders must factor in the degrees earned by such practitioners and whether their qualifications are intensive enough to equip them to deal with the rigors of modern medicine. 1 Vineetha Mg and Richa Roy are with AZB Partners and Dr. Zeena Johar is with the IKP Centre for Technologies in Public Health. Opinions expressed in this article are the personal views of the authors and not necessarily the position of AZB & Partners or IKP Centre for Technologies in Public Health.